This is a special procedure involving application of a medicated paste on the head, or in other words, it is more like a head pack. It is the traditional Ayurvedic treatment, followed in Kerala Ayurvedic centres (referred to as Thalapodhichil’), which is effective in treating various psychosomatic disorders. Shirolepa is actually considered a cooling treatment and is useful in treatment of diseases related to scalp and skin. On the whole, it is considered to be a good rejuvenation therapy too. The procedure involves application of a paste comprising various medicinal powders and herbs on the scalp. The scalp is then covered and tied with certain leaves to allow the herbs to interact with the scalp. This helps in nourishment of the scalp and the head. After about 60 to 90 minutes, the paste is removed and the oil is wiped off. Later, the head and body are smeared with medicated oils and the patient is bathed in warm water. Apart from being a treatment for stress and psychosomatic disorders, it also helps in other medical conditions like migraines, hypertension, dry vision syndrome, and in better memory and concentration. It stabilizes the nervous system of the body, offers extreme coolness to head, leading to ultimate relaxation. A treatment known as ‘Nellikka Talam’ is used in Ayurveda in treating variety of ailments including insomnia, tension, stress, and other mental conditions. The treatment involves applying a herbal paste containing ‘Nellikka’ (Indian gooseberry or ‘amla’) on the crown or forehead. Various kinds of applications are done, based on the nature of illness. Ayurvedic treatments are largely based on this ‘amla paste’. Ayurvedic practitioners use the paste in treating several other maladies too like fever, cough, asthma, stomach upsets and skin diseases. Amla paste is applied during a headache at the point of greatest pain. For anxiety disorders, apart from external application of amla paste, the juice of the fruit is squeezed from the pulp and mixed with 2 tsp. of the past, and 2 tsp. each of honey and lime juice. This is diluted in a cup of lukewarm water and given to the patient every morning. Application of this paste, not only helps in psychosomatic disorders, but also helps in managing hair problems like grey or damaged hair, headaches, sinus infections etc, and improves the sense of sight, smell and hearing of the patient. 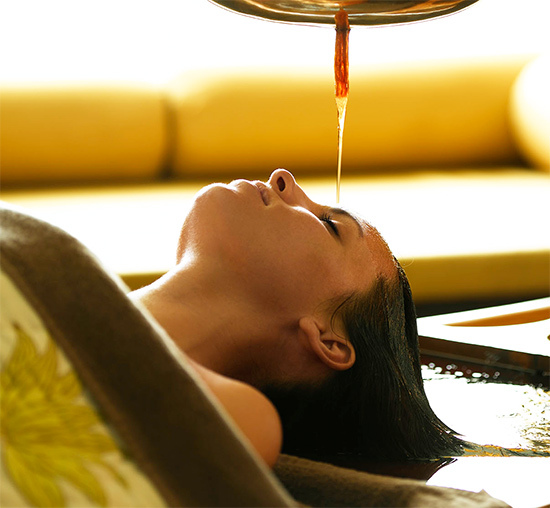 Shirodhara treatment is also sometimes performed as a forerunner in the Panchakarma treatment procedure in Ayurveda. It has been practised by Ayurvedic practitioners for more than 5000 years now.This treatment is particularly helpful in treating fatigue, headache, nervousness, insomnia and stress. Shirodhara procedure involves pouring a blend of some medicinal oils, mixing it with medicated milk or pure ghee. It is poured on the forehead through a mud pot, hung from a specific height above the person for a specific time. A headband is tied above the ear level to prevent the oil from pouring on the eyes. This treatment helps improve the functioning of the five senses, and beats insomnia, stress, depression, fatigure, vata imbalance and rejuvenates the person. Apart from these, Shirodhara also treats certain skin diseases and mental tension. Prior to performing this treatment, a 10 minute head massage is done. Shirodhara primarily works on the mental sheath, and is generally used to calm the nerves, balance vata, restore the nervouse system, and purify the mind. It helps in dealing with fatigue, mental exhaustion, anxiety, headache, nervousness, excessive thinking, and other such conditions affection a common man.